309 Methanol Synthesis Catalyst 1.widely used in low-pressure methanol synthesis reaction device 2.high quality product & exerllent service. Baisheng Methanol Synthesis Catalyst have been widely used in coal, oil and natural gas with gas and oil as raw material of low-pressure methanol synthesis reaction device (low pressure tubular column pipe and cold shock type synthesis tower, cold tube type synthesis tower etc other types of reactors).This product has the catalytic activity of low temperature, good thermal stability, selectivity high characteristic, the technical indexes have reached the international advanced level. 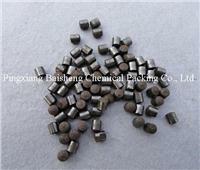 This type of catalyst mainly composed of CuO, ZnO, Al2O3 and other special additives. Beginning Activated: space time yield of methanol ≥ 1.30 g/ml.h. Thermal stability: 350°C, after high temperature heat-resistant, space time yield of methanol ≥ 1.00g/ml.h.